3 months later…sorry for the delay. I’m not sure what excuse there is beyond me just putting it off. I think in one way I’m sort of embarrassed for not having had the triumphant experience I did with Leviah. That’s not true, on any level. The difference is how much help I needed to get to that triumph–not how my do-it-myself self prefers things…an event in which everyone in the room is like family. Note the girls in the pictures. 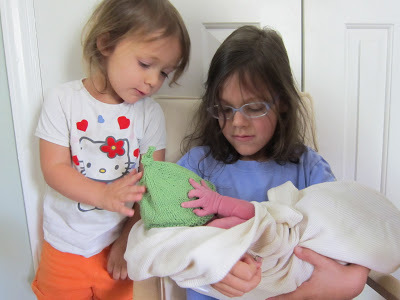 Though Naomi cried nervously this time around due to the extensive noise-making, she came out on the other side excited–and Leviah was like a rock, and now tells everyone exactly where her new sister came from–whether it’s appropriate or not. First, it’s important that you know how I feel about due dates. With this pregnancy I was hell bent on keeping numbers out of it. Having gone to 42 weeks with the last pregnancy, and knowing how crazy that made me…well, I recommend this ignorance. It helped for the obvious reason of not losing my mind when I went over plus, at those last few check ups I didn’t worry over the measurements as much as I would have had I followed a predetermined date–I was measuring small (not by the human eye–for sure). So, it starts; low, menstrual cramp like contractions began as we started our photo-op. 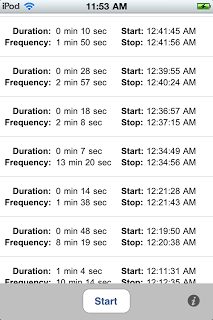 Pre-labor contractions are normal for me, like for a month to 6 weeks prior, but these contractions were not the same. Fortunately there was a public restroom at the park. We continued with our session, ran some errands (looked for strawberries at farmstands and bought a fig tree), then headed home. On the way I called my dear midwife, just to keep her in the loop. At this point I assumed it would go away as it had last time, but my midwife hit me with unexpected news, “I think you’ll have this baby tonight!”. So, we ran home to clean. we stopped timing at 5:32. Drew blew up the pool, ran to the store to buy a hose, I cleaned frantically and tried to remind the girls about what was going to happen: midwives, pool, screaming, new baby…My mom came at 8ish to watch the girls and at that point the contractions were very uncomfortable, but still, irregular. We watched about 3 episodes of American Pickers while I traveled to and from the bathroom. 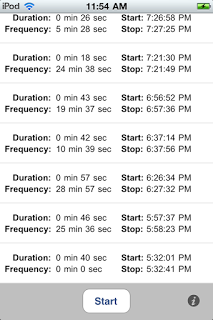 It began to storm around 10:30 or 11pm and at this time some of the contractions were about 4 minutes apart, so I called my midwife and told her she may want to come. Both my midwife and her lovely assistant were there within an hour, and we discussed the irregularity of my contractions. Though painful, they just weren’t keeping a rhythm. I paced, I got in the pool, I laid down, I paced–the hours passed. We all rested (and while I tried to get things moving along by walking around in our bedroom I was serenaded by restful snorts down the hall…). Birds were chirping. I hated those birds. The sun was rising. I hated that sun. The contractions kept coming hard and with every painful contraction there was a 5 minute pause in between–I hated these pauses. I wanted to push forward and be done because exhaustion was settling in…I could sense that the break was keeping the baby from coming. At about 8:30 I tried squatting and my water exploded. At this point I was not prepared to stand much, my legs were worn out, so laying on my side I pushed and screamed and thought to myself about the impossibility of pushing this baby out. There were lots of pushes and no crowning and it was the most frustrating thing of my life. But, thanks to the clever persuasion of my midwives who moved something down there out of the way (lovely imagery), the baby came. 9:23am. The GIRL came. (admittedly this fact was shocking to me, and I believe my response to Drew who first told me was, “you’re kidding me!”. Not that we don’t love girls, but I think everyone secretly wants one of each and everyone, from the waitress at the Mexican restaurant when I was only 4 months to the old antique junk collector at a yard sale when I was 35 weeks to my mother and my best friend, said it was a boy. My belly misrepresented it’s cargo apparently. Anyhow. That is the story of how Eliza came. I didn’t mention the fact that had I been in a hospital, the odd contracting would have led to pitocin, the pain from that to epidural, and the lack of feeling and odd position of the baby to a cesarean. All this to say that I believe homebirth is not only a safe option for women in normal birthing conditions, but perhaps SAFER (as the studies show). Something interesting? My midwife noted 2 things about Eliza post-birth. 1. She held her left arm up to her face, probably because that’s where it’d been all along in utero. This makes sense, because I’d often felt a ‘low scraping’ with her that’d I’d never felt with the others. 2. She appeared to be more like 41 weeks based on her skin, fingernails, etc. Funny, since I measured 35cm only 1 week before…Just goes to show what we can’t know for sure. **thank you my sweet midwives, for risking yourselves for the sake of my well-being in a state that doesn’t recognize the importance of this choice. we love you. ***it has been brought to my attention that I forgot to mention the support of my husband, who was there for the entirety of the event–even at it’s conception 😉 and without whom none of this could have taken place. And, while I’m adding, i’ll mention my mom, who also has played a significant role in my births (including my own). This is how Birth SHOULD be!!!! Thank you for sharing!!!!! Thanks for sharing Lacey- you've inspired me to write down my experience too. Our baby Silas is 7 weeks old today. Your family is beautiful. Thank you so much for sharing! When we share our voices and experiences it supports the community. Amazing!!! Thank you for sharing and CONGRATULATIONS!!! Oh, and I know that scraping, I had it with C and it was torture. I didn't have it with R, nor with this one so far – I always said she was trying to 'claw her way out'. Funny, I'll have to look back at pics to see what she was doing with her arm shortly after birth. Anyway, CONGRATULATIONS AGAIN!!! Thank you SO much for sharing this story! And congratulations on the birth of your beautiful daughter. I am so glad to hear your story, and that you had midwives who chose to support you. I wish there were such caring providers for every mother and that our country would value its midwives. 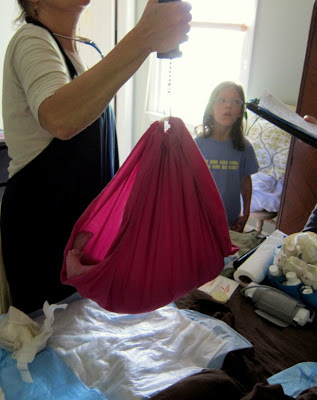 They are so essential and I agree that homebirth is often safer on so many levels. 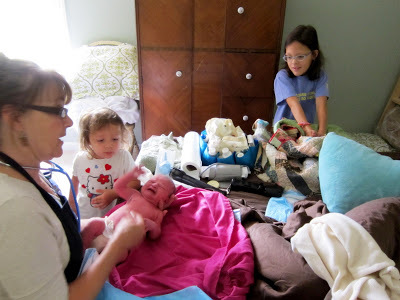 I feel so thankful every day that we had a homebirth! So awesome- I love your birth stories! Ahhh, birthing never goes how we would expect it to, but when an amazing little person arrives, it almost doesn't matter in the end. I haven't homebirthed. When I got pregnant with our third, it was heavily on my mind. I lost that baby, but I did get the chance to think through it. I know many would look down our choice, and maybe it is just our hospital, but my hospital births were incredible. My babes came with no epidural, with my roaming, stripping, bathing, squatting, and screaming as I pleased. And I was made to feel as though I were the first and only to ever give birth. Eliza and her big sisters are just beautiful.